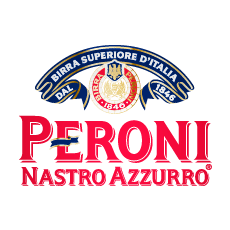 Peroni Nastro Azzuro, or Peroni's Blue Ribbon in English, is the beer that defines Italy's 'dolce vita', the sweet life. The Birra Peroni brewery was established in the Pavia province in 1846. It was a combination of climate, close proximity to the mountains - where ice and glacial water was plentiful - and the quality of ingredients that helped Francesco Peroni create such a distinctive pale, medium-strength beer that within a short time became vastly popular. 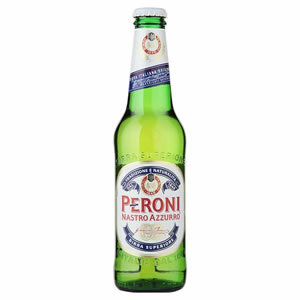 Peroni's popularity and smooth taste makes it perfect for office parties or simply within a relaxed social event. Get your Peroni Lager from Zepbrook tomorrow: order before 5pm if you're in London (or the M25 area). Do you need lagers that are not currently listed on our website? Contact us - we can source and deliver many other products for a competitive price. Call us now on 020 8752 0110 or enquire online. With its creamy taste and malty aromas, this refreshing beer also has a light bitterness. 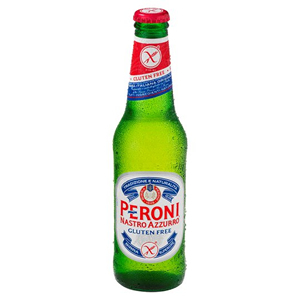 The great taste of Peroni - but gluten free.